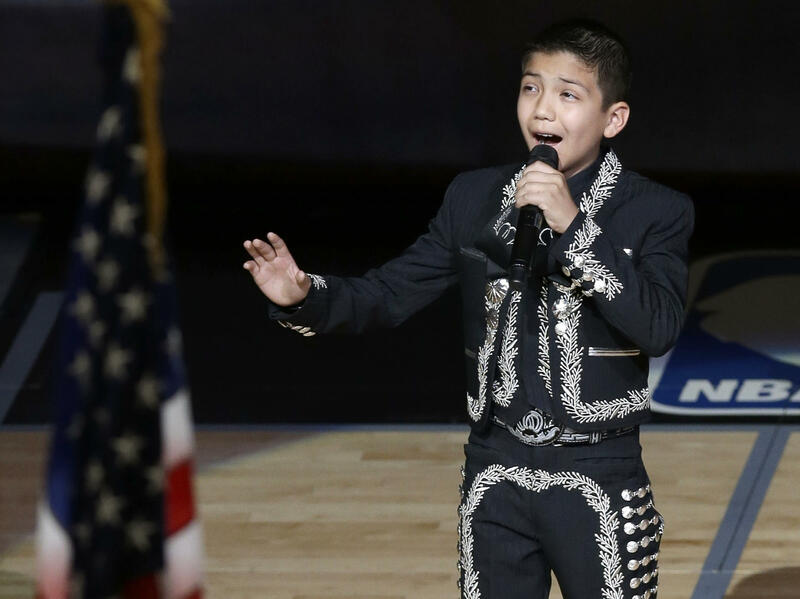 Sebastien de la Cruz gave an encore performance of "The Star-Spangled Banner" before the NBA Finals game on Thursday. It's not often an 11-year-old boy gets to sing the national anthem twice during the NBA Finals. But, as our friends at The Two-Way reported, it's been a surprising week for Sebastien de la Cruz of San Antonio. Known as "El Charro de Oro" (or, figuratively, the boy with the golden voice), Sebastien was born and raised in San Antonio. The Mexican-American boy first belted his heart out for his home basketball team, the Spurs, on Tuesday night — which actually wasn't even supposed to have happened. Sebastien was a last-minute replacement singer for Tuesday's game, says San Antonio Express-News columnist Jeanne Jakle, who has followed Sebastien since his TV debut last year on America's Got Talent. "It was just luck that he was able to say yes," Jakle says. "In fact, he jumped at the chance. He loves the Spurs." Sebastien described the experience as "amazing" to local TV station KENS 5. "To be honest, it was actually in slow motion for me," Sebastien said. "I don't know how to explain it. It was just one of those moments." But that moment turned sour when the booing began online with racist comments saying a Latino kid dressed in a traditional mariachi outfit should not sing the national anthem. In response to the online vitriol, the Spurs invited Sebastien back Thursday night for an encore performance that was introduced courtside by San Antonio Mayor Julián Castro and his wife, Erica. Castro said whether Sebastien is wearing a mariachi outfit or a kilt, the fact is the kid's got talent. The mayor insists he is as much the face of America as any other child. "Folks should not be surprised that you have a young man with brown skin in a mariachi outfit but who was born in Texas and is a proud American who is singing our national anthem," he said. That, Castro added, is the America that we live in in 2013. It's not often you get to sing the national anthem twice during the NBA finals, but it's been a surprising week for an 11-year-old boy in San Antonio, Texas. We have his story from NPR's Hansi Lo Wang of Code Switch, our team reporting on race, ethnicity and culture. HANSI LO WANG, BYLINE: They call him el charro de oro - figuratively, the boy with the golden voice. JEANNE JAKLE: He wasn't even supposed to sing that night. WANG: San Antonio Express news columnist Jeanne Jakle has followed Cruz since his TV debut last year on "America's Got Talent." She says Cruz was actually a last-minute replacement for Tuesday's game. JAKLE: It was just luck. In fact, he jumped at the chance. He loves the Spurs. WANG: Eleven-year-old Cruz spoke with local TV station KENS-5. : To be honest, it was actually in slow motion for me. I don't know how to explain it, but it was just one of those moments. JAKLE: This was a kid; a tiny, sweet boy. WANG: Last night, the Spurs invited Cruz back for an encore performance. Courtside, San Antonio Mayor Julian Castro and his wife introduced Sebastien de la Cruz. Castro insisted he is as much the face of America as any other child. MAYOR JULIAN CASTRO: So folks should not be surprised that you have a young man with brown skin in a mariachi outfit, but who was born in Texas and is a proud American, who is singing our national anthem. WANG: And that, Castro adds, is the America that we live in, in 2013.
: ...and the home of the brave. You are listening to ALL THINGS CONSIDERED. Transcript provided by NPR, Copyright NPR.